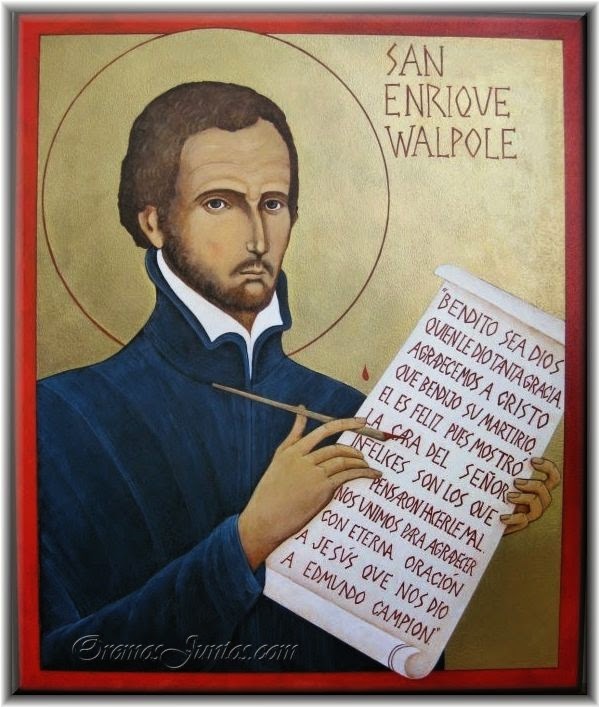 Apr 7 – St Henry Walpole, SJ, (1558-1595), Martyr, Poet, Priest | ADULT CATECHESIS & CHRISTIAN RELIGIOUS LITERACY IN THE ROMAN CATHOLIC TRADITION: hosting ONLY True Christians!! !, or "How to think Catholic!!" 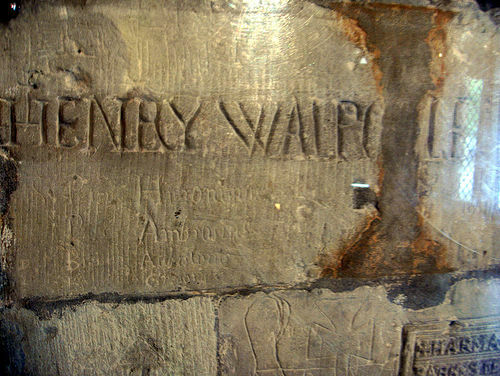 Son of Christopher & Margery, from a large family of boys, witty & bon vivant, in his early twenties, Henry Walpole was indifferent to sufferings of his fellow Englishmen for their beliefs until he attended the execution of the well known Edmund Campion, SJ, and blood from the martyr fell upon him. A baptism? Surely. Of the most profound kind. 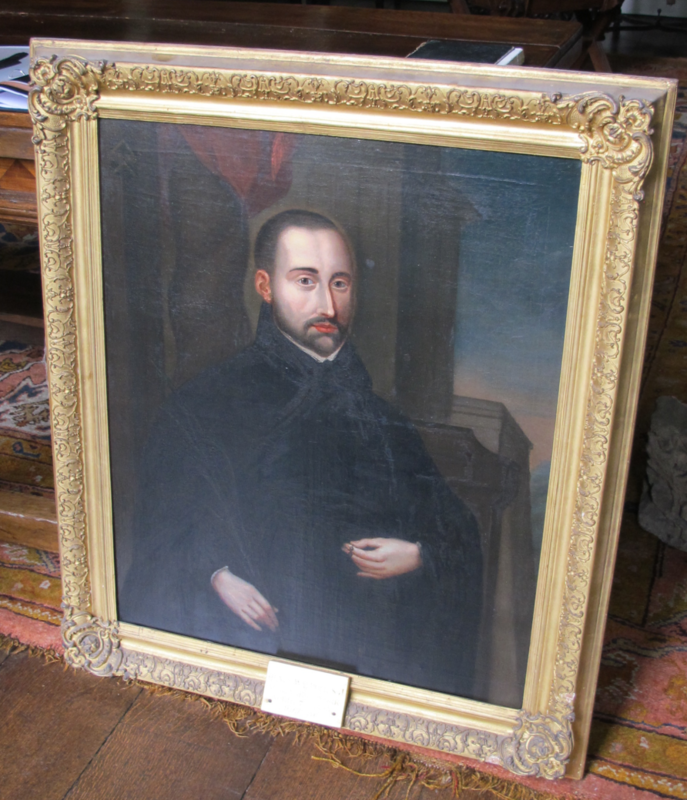 Henry Walpole was inspired by the courage of the Jesuit martyr to become a priest for his native England. A conversion had begun…deep and profound. Falling in love. He was arrested, however, almost as soon as he set foot on English soil and spent more time being tortured in prison than some Jesuits spent ministering the sacraments. Walpole had been born Catholic but was not sure which direction to follow in the religious controversy that roiled England. He attended the discussions that Campion held with Anglican divines and been impressed with the Jesuit’s zeal and preaching. He was also present at the Jesuit poet’s execution. A drop of Campion’s blood fell on his clothes from the martyr’s quartered body, confirming his sense that God was calling him to follow in Campion’s footsteps. He even wrote a poem honoring the dead Jesuit. “Why do I use my paper, ink and pen? Or call my wits counsel what to say? I speak of saints, whose names cannot decay. Their glorious deaths, if such on earth were found. His native flowers were mixed with herb of grace. His mild behavior tempered well with skill. A lowly mind possessed a learned place. A sugared speech, rare and virtuous will. A saint like man set in earth below. The Bar bears witness of his guiltless mind. Tyburn doth tell, he made a patient end. For heaven and earth will still record the same. His pen must cease, his sugared tongue be still. How far beyond the sound of tongue and guile. Walpole studied at Cambridge and then moved to London to study law, but then changed direction and decided to become a priest. Described a year later after witnessing Campion’s execution as “discreet, grave, and pious”, he entered the English College in Rheims, France in July 1582 and then moved to Rome nine months later. 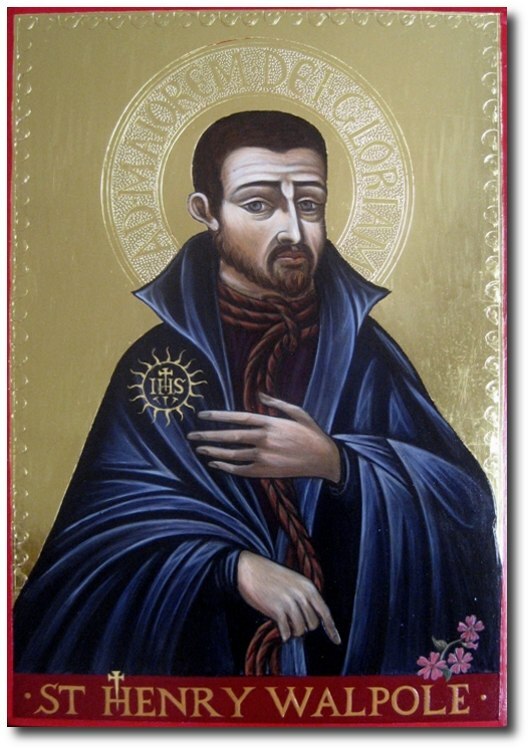 On Feb. 4, 1584 he joined the Society of Jesus and completed his studies at the Scots College at Pont-à-Mousson, France. After he was ordained in Paris, he was assigned to be chaplain to English Catholic refugees serving in the Spanish army in the Low Countries. He spent a year in prison after he was captured by the Calvinists in 1589, and then worked at the English seminary in Valladolid, Spain until he was finally asked to return to England in 1593. The Jesuit, his brother and an English soldier sailed together on a French ship headed for Scotland because the southern ports of England were closed because of the plague. On Dec. 4, 1593, the three passengers were put ashore at Flamborough Head, Yorkshire, after 10 days of stormy sailing, but separated on land. Father Walpole was resting at an inn 10 miles inland when he was arrested for being a priest; he had been betrayed by a fellow passenger who was earning money to buy his way out of prison. Walpole endured torture 14 different times before being returned in 1595 to York to stand trial under the law that made it high treason for an Englishman simply to return home after receiving Holy Orders abroad. The man who had once aspired to be a lawyer defended himself ably, pointing out that the law only applied to priests who had not given themselves up to officials within three days of arrival. He himself had been arrested less than a day after landing in England, so he had not violated that law. The judges responded by demanding that he take the Oath of Supremacy, acknowledging the queen’s complete authority in religion. He refused to do so and was convicted of high treason. On April 7, Walpole was dragged out of York to be executed along with another priest, Bl. Alexander Rawlins of the Diocese of Gloucester, who was killed first. Then the Jesuit climbed the ladder to the gallows and asked the onlookers to pray with him. After he finished the Our Father but before he could say the Hail Mary, the executioner pushed him away from the ladder; then he was taken down and dismembered. In St Henry Walpole, SJ, Catholics received yet another example of fidelity and courage. 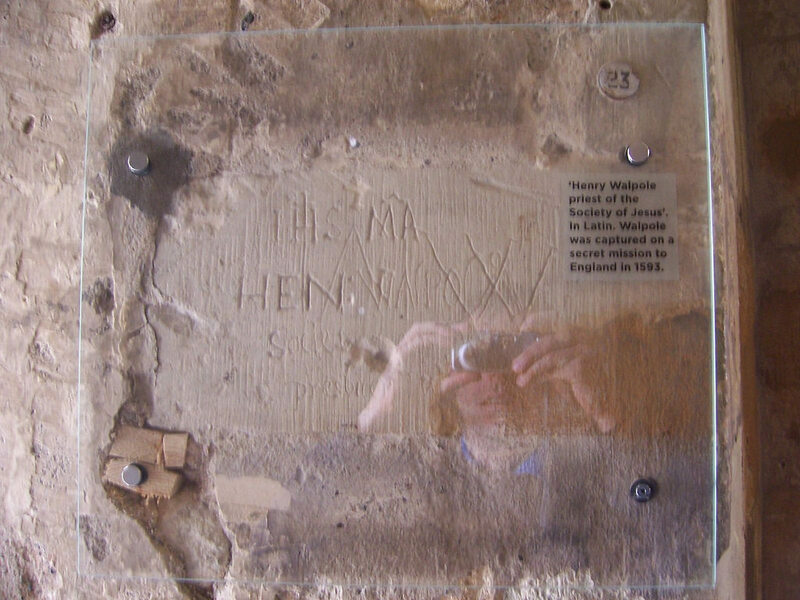 -inscription left by St Henry Walpole, SJ, in his prison cell in the Salt/Beauchamp Tower, Tower of London. Below his name, more lightly inscribed, he imprinted the Latin names of Sts Paul & Peter, along with those of Sts Jerome, Ambrose, Augustine, & Gregory, four Doctors of the early Church. Henry Walpole, SJ’s ghost supposedly haunts Anmer Hall, where William & Kate, Duke & Duchess of Cambridge, are happy to raise Prince George.